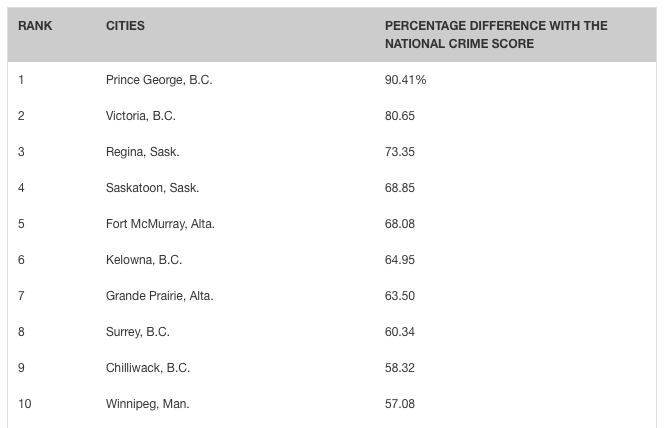 Tonight I came across Maclean’s Magazine’s rankings for Canada’s most dangerous cities, based on the percentage difference with the national crime score. Here’s the top ten, with the top two spots belonging to British Columbia, followed not-so-closely by Regina, Saskatchewan. The top 10 most dangerous places to live in Canada. Out of curiosity, I thought, what are the chances that the most dangerous place to live in Canada is also the worst place to go to school? 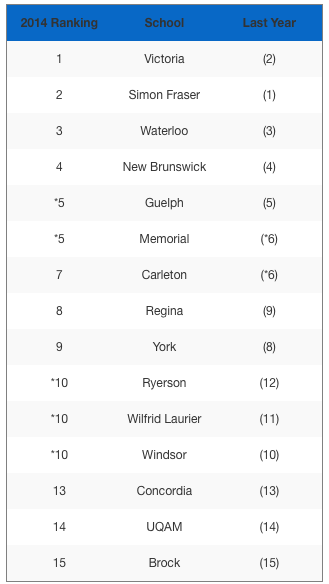 Comprehensive top ranking universities in Canada by Maclean’s Magazine. Yep, there you have it. The best overall university in Canada is the University of Victoria, which, according to the same publication, is also the second most dangerous place to live in the country. It would be a broad, silly statement to imply that Maclean’s is knowingly suggesting students attend university in such a dangerous place, but I do find it interesting that these statistics line up the way they do.